If you haven't visited Gentlemenoffortune.com before, Welcome Aboard!. When you look around, you will see that this is probably one of the most in depth sites anywhere dedicated to providing information and resources for those interested in re-creating a the Golden Age of Piracy (GAoP). I want to take this opportunity to welcome you aboard on this page, because about 30% of the folks that have found our site got here by google'ing "pirate ships". So.... did you win the lottery and are looking for information on how to go about getting a pirate ship built? There are some very good sites on the web that provide overviews of ship types and construction, and if you are interested, I can recommend Schooner Man and the Tall Ship Database to get you started. Unfortunately for us though, shipbuilding during the GAoP didn't get accomplished via blueprints and paper plans. Instead, ships during the period, were constructed from a designers model. A ship designer would make a miniature model of the concept, and the builder would use that as a reference for building the ship. The historical record shows us that the majority of pirate ships during the Golden Age were fast and "smallish" sloops. Of course, there are exceptions, as some of the heavy hitters in the GAoP pirate world had big ships with lots of guns, but they didn't start out that way. I have scoured the cyber seas, and there are very few if any existing early 18th Century reproduction ships afloat. Let me clarify the language a bit to say that "Reproduction" will be used to describe a ship that was built, from the beginning, as an Early 18th Century Ship. A "Retrofit" ship, will be one that has been "modified" to have the characteristics of a historical ship. I am not saying that one is better than the other, I just want to make this distinction. Let me remind everyone that a ship is a hole in the ocean where you pour money and a period tall ship is no different. By far, the majority of these ships are owned by non-profits or government institutions. Those that are privately owned and maintained quickly become their owners life. Its nice to dream though, so until you win the lottery, here are some ships that you can visit, sail on, or at least see at various events. 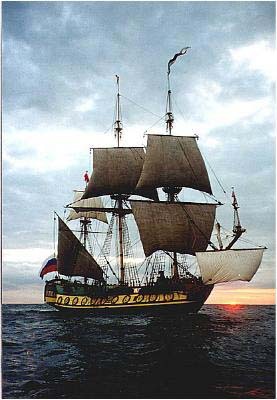 Peter the Great had a dream of a Powerful Russian Navy. He had traveled extensively around Europe, and spent a considerable amount of time in Holland and in England where he studied their shipbuilding and techniques and their harbors. When he returned to Russia, he commissioned his first Navy Ship, The Frigate Shtandart. The "Shtandart" was constructed with the guidance of a Dutch master, Vibe Gerense. The ship was built in five months by a work force of about two hundred . She was in commission from 1703 to 1728, though not always in service. She took part in several military campaigns, then was laid up in 1719. Tsar Peter was very fond of this ship, and he decreed that she was to be preserved forever as a monument to Russian shipbuilding. But, after his death in 1725, she was found to be in very bad condition, and was broken up. n 1994, a young Russian shipbuilder, Vladimir Martous, began his dream - to recreate the Shtandart. Despite there only being an engraving of the original ship, plans commenced. She was built as near as possible with methods and materials used to build the original ship. 250 hand-felled trees, 8000 handmade nails and almost 5 years of hard work went into her construction. The present day Kalmar Nyckel serves as Delaware’s seagoing goodwill ambassador. She was built by a group of committed citizens to be a continuing witness to the courage and spirit of those individuals who undertook the mid-winter North Atlantic crossing in 1637-1638. This is the ship that most Mid-Atlantic re-enactors will see. The Pirate Brethren have worked with the ship exstensively and some have even crewed the ship at times. Technically, the ship dates a little earlier than the GAoP, but probably represents a design that could have been in the waters during the Golden Age. "The VOC (Dutch East India Company) ship Amsterdam ran aground near Hastings, England on 26 January 1749, on her maiden voyage to Batavia. The Amsterdam was laden with textiles, wine, stone ballast, cannon, paper, pens, pipes, domestic goods and 27 chests of silver guilder coins." 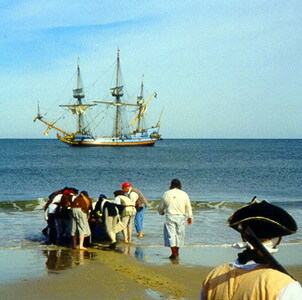 A ship replica was built by 400 volunteers using tools of the period, between 1985 and 1990. It was floated to Amsterdam and is situated next to the Netherlands Maritime Museum (Nederlands Scheepvaartmuseum). The Amsterdam is a "Museum Ship" that doesn't really sail, but offers a static glimpse of life aboard ship during the 18th century, and how cargo was moved over the open ocean. The Götheborg a replica of an 18th Century East Indiaman. The original Götheborg sank off Gothenburg, Sweden, on 12 September 1745 while approaching its home harbour after returning from her third voyage to the Far East. All sailors survived, but the ship was lost. When the wreckage of the vessel Götheborg was found in 1984 the idea emerged of making a replica of the vessel. The keel for the replica was laid the 11 June 1995. The vessel was built using traditional means and is as close to the original as possible. One small change is that the height of the deck is 10 cm more as today's seamen are taller than their ancestors. While the exterior remains true to the original, the interior is highly modern with electricity and propellers powered by diesel engines. The engines were only intended for port navigation and in emergency situations, but, in reality, they are used when winds are unfavorable. Batavia was a ship of the Dutch East India Company (VOC). 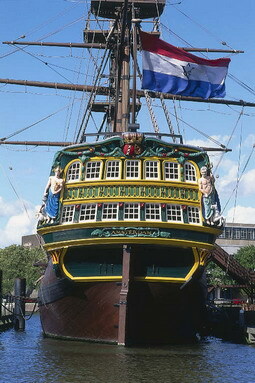 She was built in Amsterdam in 1628, and had 24 cast-iron cannons. Batavia was shipwrecked on her maiden voyage, and made famous by the subsequent mutiny and massacre that took place among the survivors. 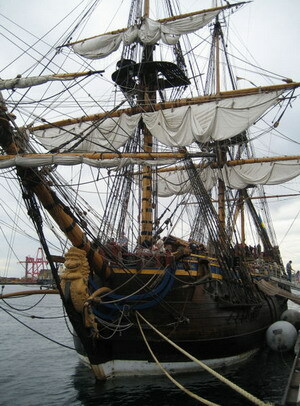 A twentieth century replica of the ship is also called the Batavia. 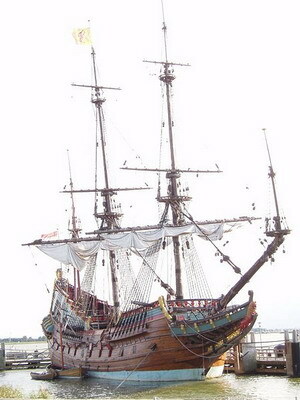 A replica of the Batavia was built at the Bataviawerf (Batavia Wharf) in Lelystad in the Netherlands. The project lasted from 1985 to 7 April 1995, and was conducted as an employment project for young people under master-shipbuilder Willem Vos. The shipyard is currently reconstructing another 17th century ship. In contrast to the merchant ship Batavia, Michiel de Ruyters' flagship, the Zeven Provinciën, is a ship of the line. The Batavia replica was built with traditional materials, such as oak and hemp and using the tools and methods of the time of the original ship's construction. For the design, good use was made of the remains of the original ship in Fremantle (and of the Vasa in Stockholm) as well as historical sources, such as 17th century building descriptions (actual building plans were not made at the time) and prints and paintings by artists (who at the time generally painted fairly true to nature) of similar ships.